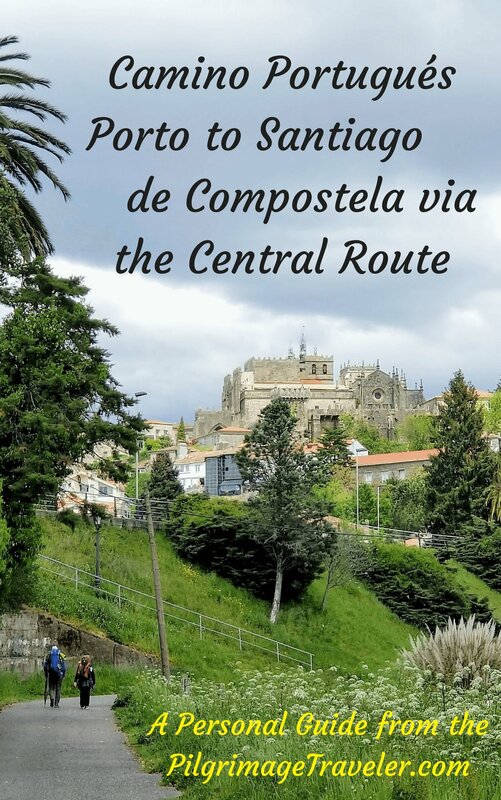 On our day twenty on the Camino Portugués, along the Coastal Route initially, and then the Senda Litoral, we combined stages to do one-and-a-half traditional stages, with the help of the local bus route. 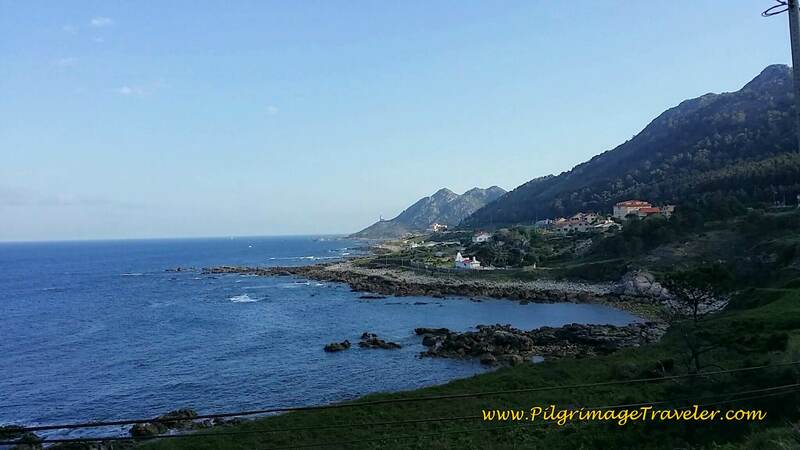 The first part of our Camino was from Viladesuso to A Ramallosa on the Coastal Route. It will be 3 kilometers shorter if you are starting in Mougás. 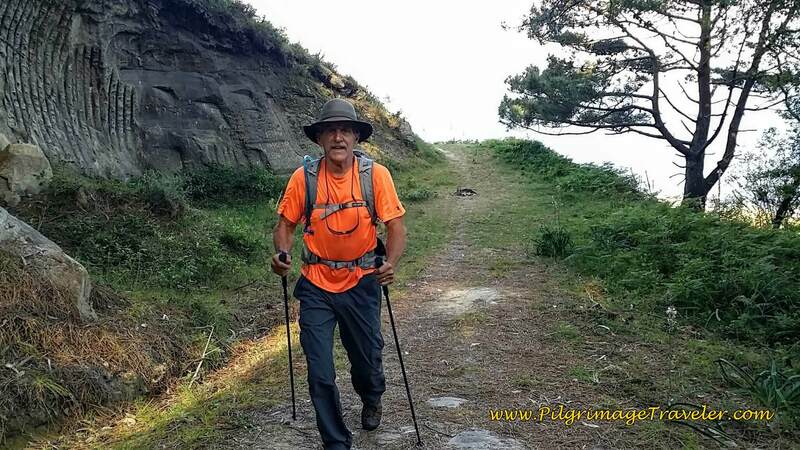 Ours was 19.15 kilometers (11.9 miles) from our friend Glyvia's house in Viladesuso. 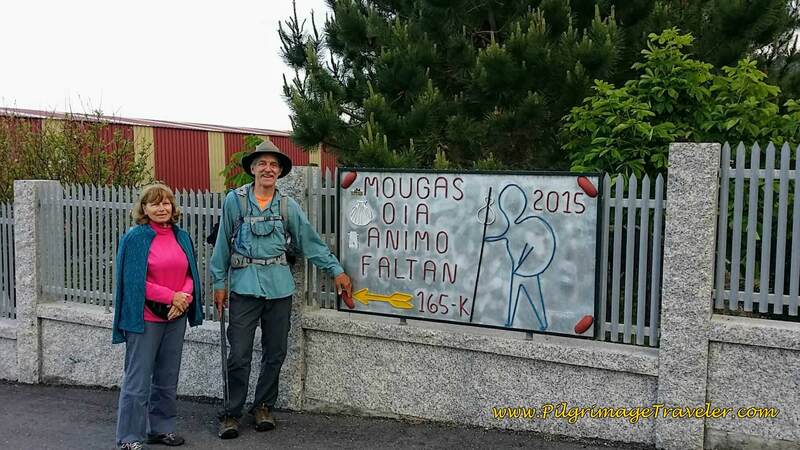 It will only be 16 kilometers (10 miles) if you are starting in Mougás and ending in A Ramallosa. 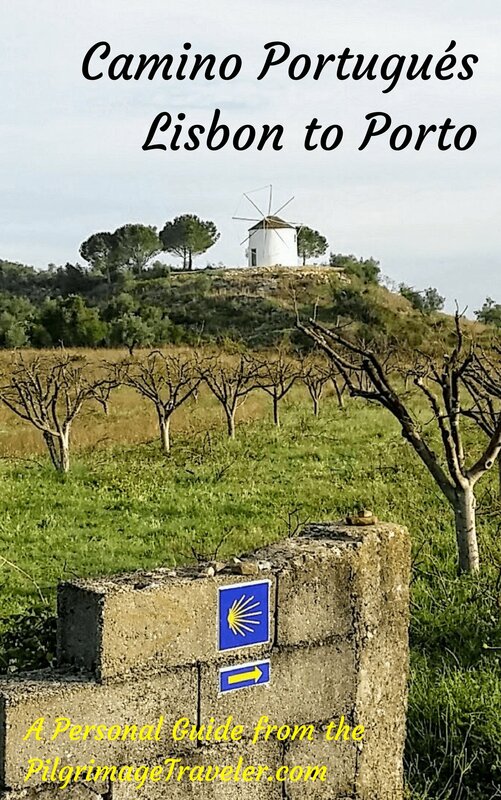 Our second part was from A Ramallosa to San Miguel de Oia, now along the Senda Litoral for a total 8.47 kilometers (5.26 Miles). We did this to combine the next three, short traditional stages into two, as we were walking strong and wanted to cover more ground. 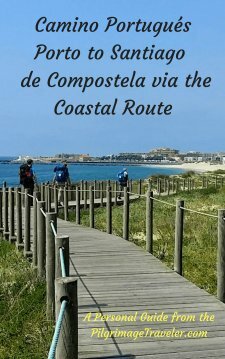 We also wanted to walk the final available beaches on the Senda Litoral before joining the Central Route in Redondela a day later. Unfortunately there is no accommodation from A Ramallosa until Vigo, and this was too long a walk for us to go all the way there. 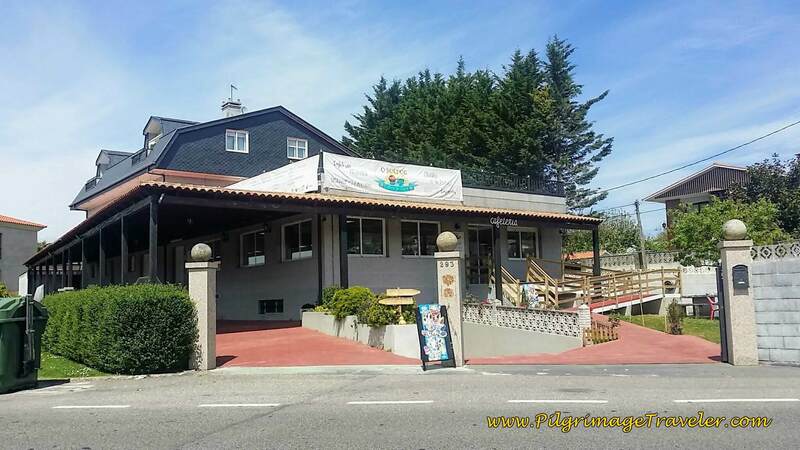 We took a bus from San Miguel de Oia, back to Baiona, where our friend picked us up, to stay in her home, the Albergue Glyvia for another night! What a treat! Here are my google maps for day twenty, created from my uploaded GPS tracks for the day. I placed the albergues/hotels/cafés on the maps that we visited. For a complete list of accommodations, click here. 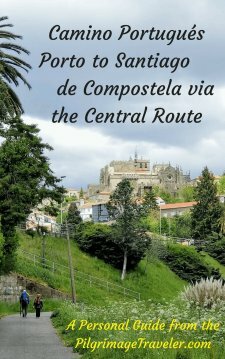 There are plenty of services along the way on this entire route, just no accomodation after A Ramallosa on the Senda Litoral, until Vigo. 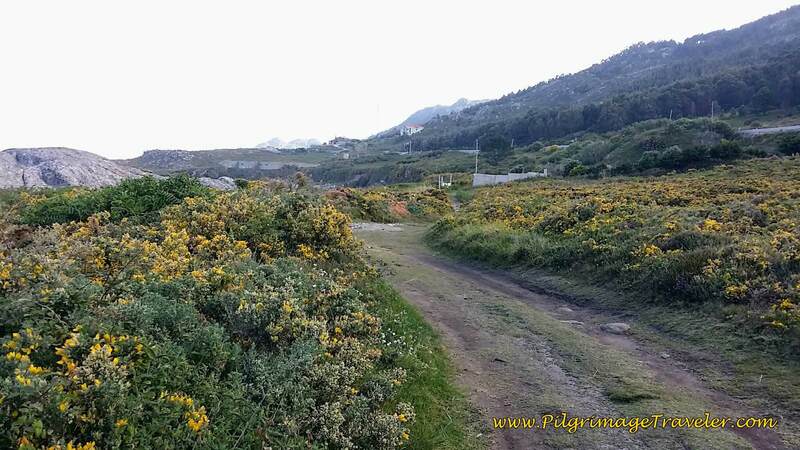 There are accommodations farther inland in Nigrán if you are doing the Coastal Route, where you can add another 3-4 kilometers onto your day twenty if you desire. 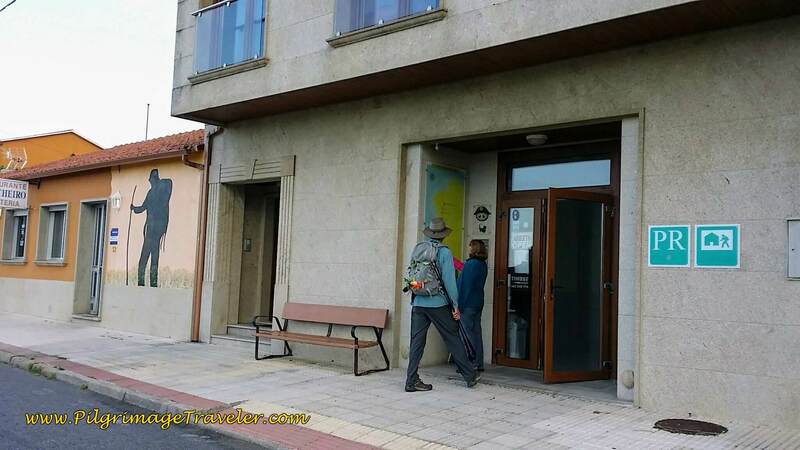 There may also be an albergue in Saiáns, if you don't mind diverting inland. Check the accommodation list carefully. Otherwise, end your day in A Ramallosa or bus back to the Baiona area if you wish to add on more kilometers like we did. You will see, below, is very easy to do. There are two relatively significant climbs on the first part of the day, 100 and 70 meters, that you can see on the elevation profile below. For the second part of the day, there is a milder climb from the coast to meet the PO-325, of about 50 meters. 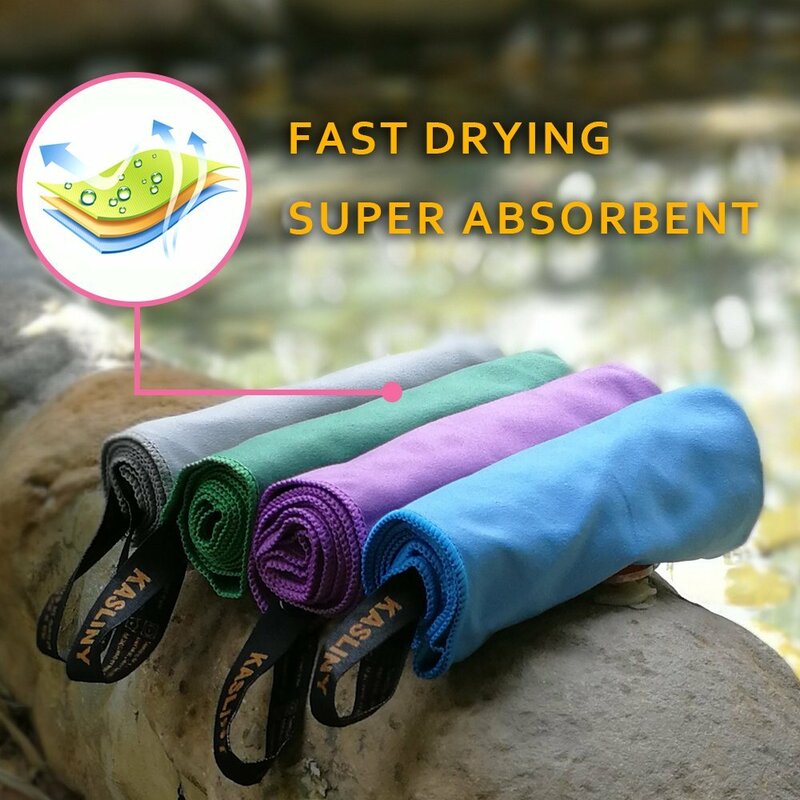 Nothing super strenuous, yet your body will notice! We began our day at our friend Glyvia's house with a hearty continental breakfast, including bread and cheese. It was a great start to the day. We had stayed overnight at her "Albergue de Glyvia." 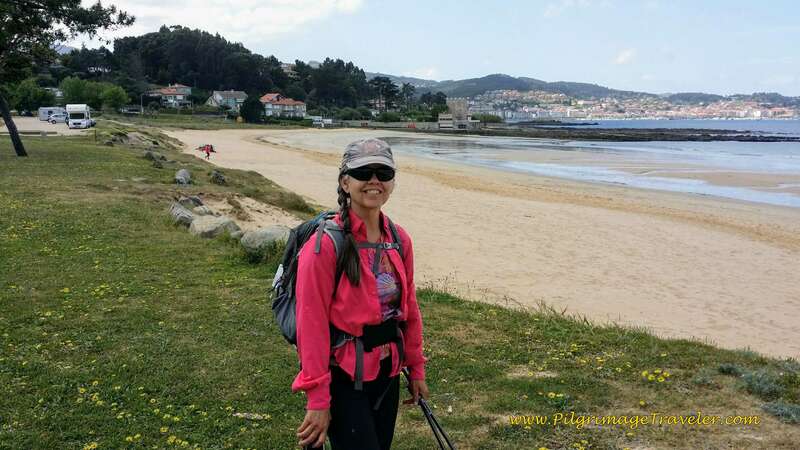 She decided that she wanted to walk the first few kilometers with us to the albergue in Mougás. We were thrilled. 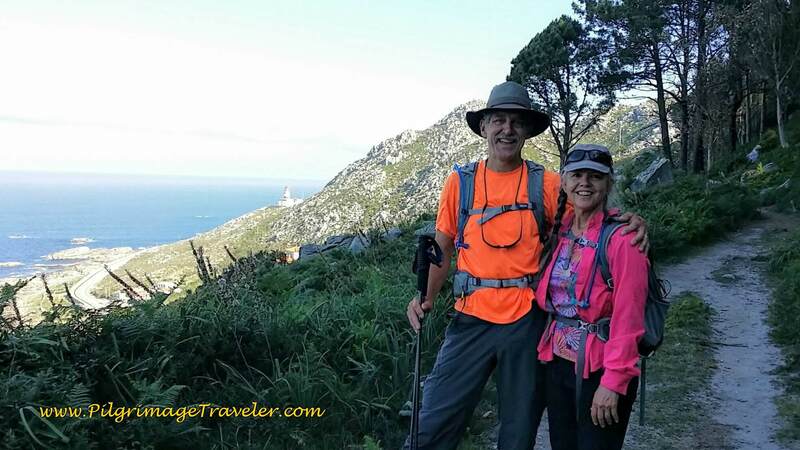 We talked to her about our plan to take the bus back from halfway through the second stage in San Miguel de Oia, to the albergue in A Ramallosa. She offered to have us stay at her house again, if we were willing to bus back to Baiona, where it would be easier for her to pick us up! We we thrilled again! Another night in the Albergue Glyvia?? Absolutely, of course! Since it is one hour later in Spain than Portugal, it did not get light until about 8:30 when we set off for the day. We started from the waymark where we left off on day nineteen. This quiet paved road that runs almost by Glyvia's house, essentially parallels the PO-552, but now to the east. The planners of this route keep the pilgrimage traveler off the highway whenever possible. The seacoast was just beginning to brighten up. I love the post-dawn light on the sea! 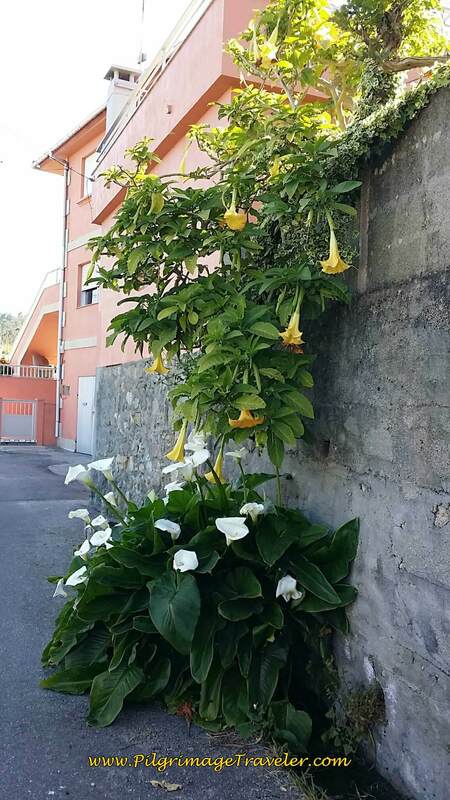 The Calla Lilies lined the roads. 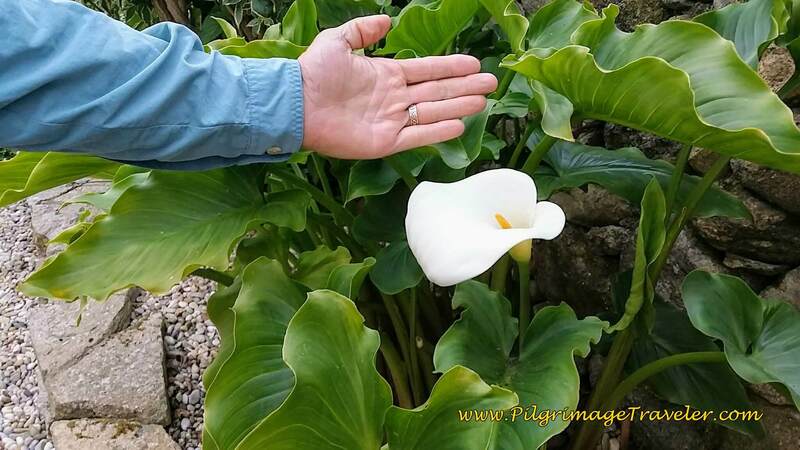 They grow so incredibily wild and huge here, just like in Portugal. 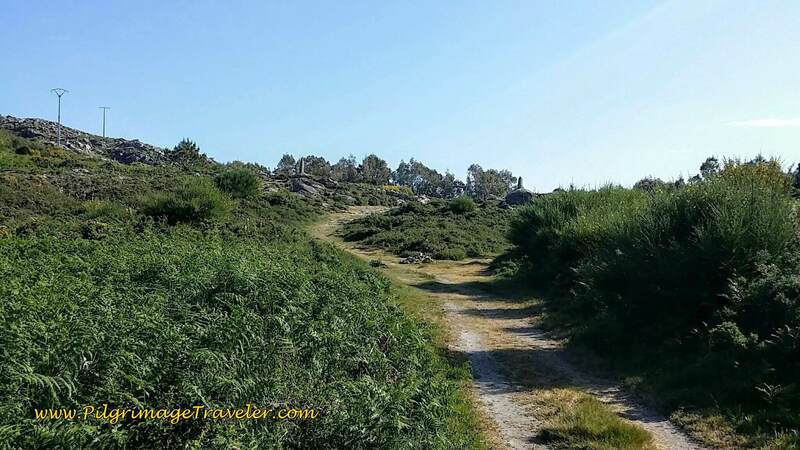 The Camino meanders through Viladesuso, staying on quiet, unnamed paved roads. We followed the first road about 1/2 kilometer, until it almost bent around to the highway, but then turned right to avoid it. Onward onto the next paved road, about a third of a kilometer, then we came to a T, where we turned left. 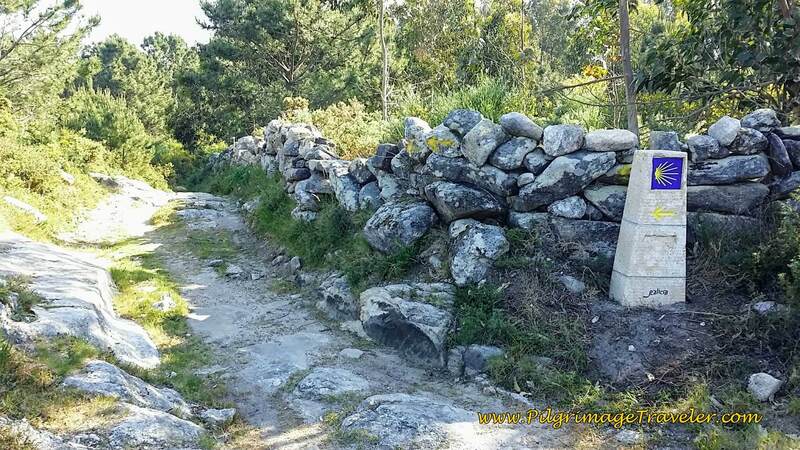 ... to walk along this high wall on a path, that shortcuts to the street called the Lugar o Porto to arrive in the town of Mougás. 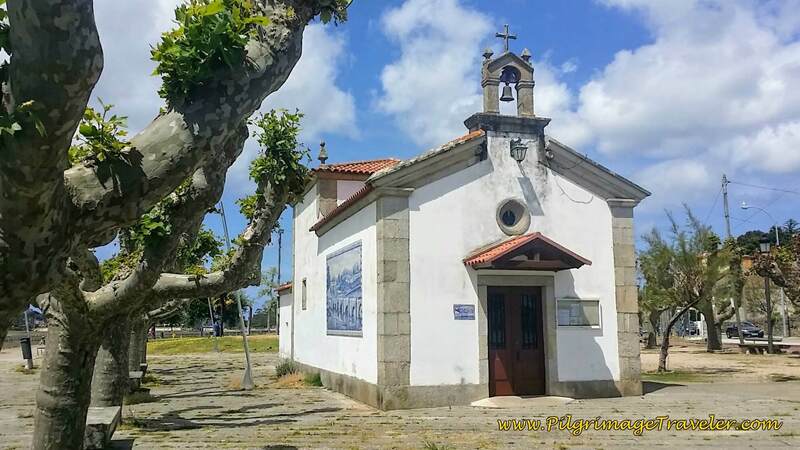 A nice sign for pilgrims greets you on the Lugar O Porto street in Mougás, where you turn left. I have no idea what this sign means! 165 Km is approximately the distance left to Santiago from here! 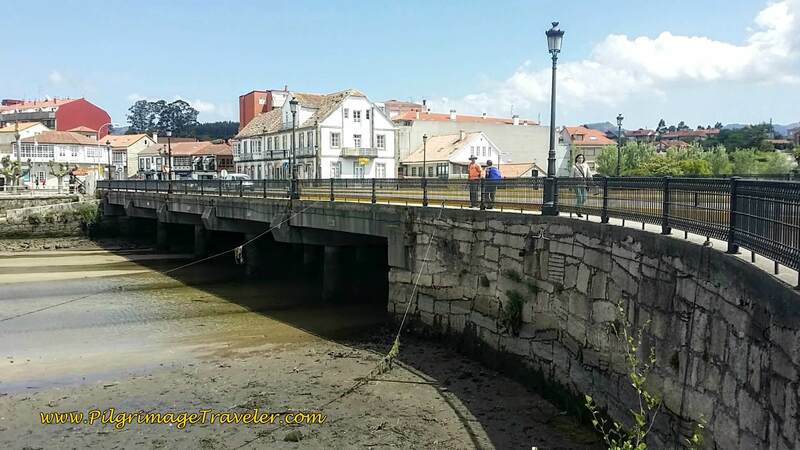 Walk a few hundred meters until just before the PO-552, then make a quick right to avoid it as the Lugar O Porto continues to run north and parallel to the highway, as it becomes the Camiño de Salcidos. 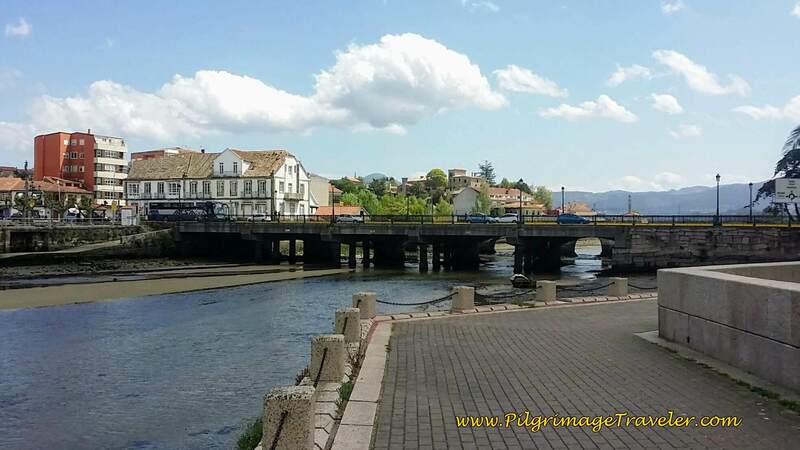 In a quarter kilometer, the Camiño de Salcidos ends at the highway, crosses over it to join a nice foot path. 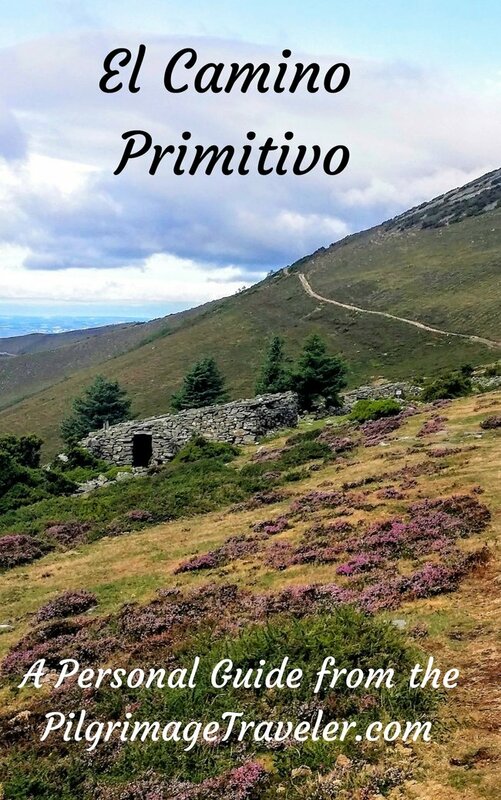 Follow the footpath along the highway, with the Albergue Turístico Aguncheiro just another quarter kilometer ahead. Turn left onto the paved road in front of the albergue. You will see the sign for the albergue, so you can't miss it really. 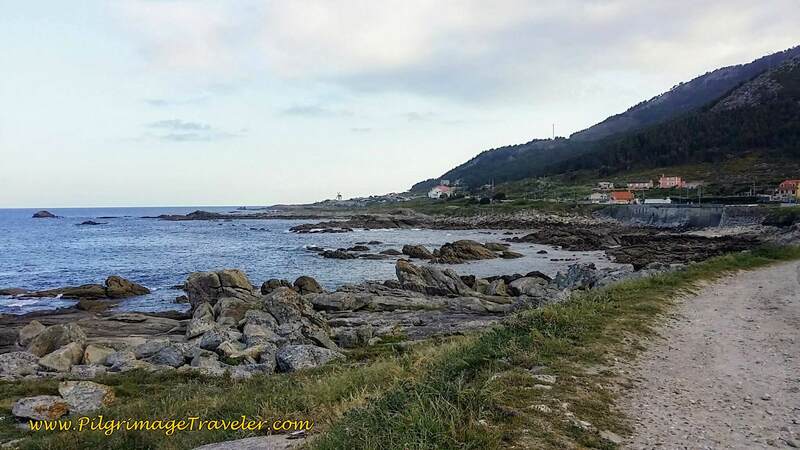 Follow the paved road, past the albergue and along the coast about 3/4 kilometer. The road joins the PO-552 and its nice bike lane. 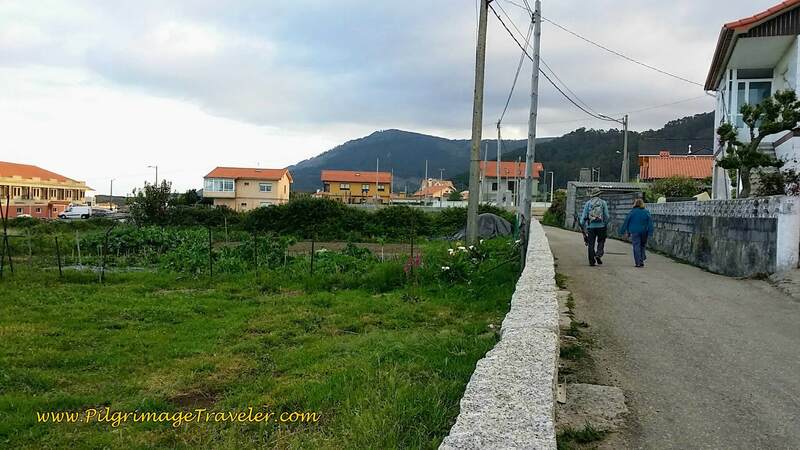 Then the Camino turns left on a dirt lane, once again as you get closer to the windmill at the camping bungalow park. After another four hundred meters, the lane joins the highway again to walk past the restored windmill at the park. We said goodbye to Glyvia here, at the windmill. We would join up with her later in the day. Our packs were very light as we left many of our things at Glyvia's house. It was such a wonderful thing to carry only a few essentials for the day. 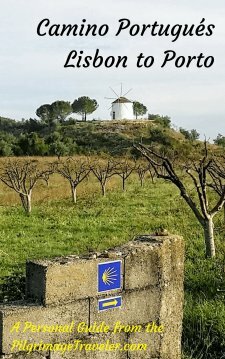 After passing the windmill, we walked to the side of the highway for another 0.4 kilometers, where the Camino veers left to walk on a yet another dirt lane, below. Then it switchbacks back on itself in a quarter kilometer, to climb back up to the highway. A whole lot of extra walking to avoid a small stretch of highway. If I were to do it again, I'd just take the highway through this short section! The seacoast is quite gorgeous here, however, so perhaps it was worth it. This bush was alive with yellow spring blooms. Joining the PO-552 after the short diversion, with the walking/bike lane that continues. The next landmark to watch out for is the lighthouse at Cape Silleiro. While the route does not walk there, but shortcuts through the next peninsula, one can see it for quite a ways along the highway. The walk along the highway is almost 2.5 kilometers. The bikeway allows the pilgrimage traveler to walk on the shoulder safely, thru A Ermida and just before As Mariñas, is the turn off. You can't miss this sign! 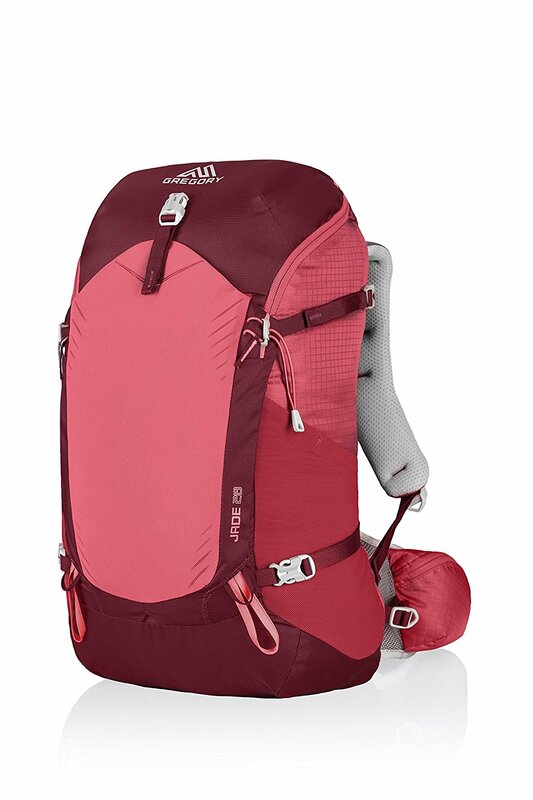 You can make the choice to continue on the PO-552 to create your own Senda Litoral. It is much longer than shortcutting over the mountain, but you won't have to climb the hill. Our Japanese friend, Hiro, confessed to us later that he chose the PO-552 to avoid the hill climb. Each to his own! 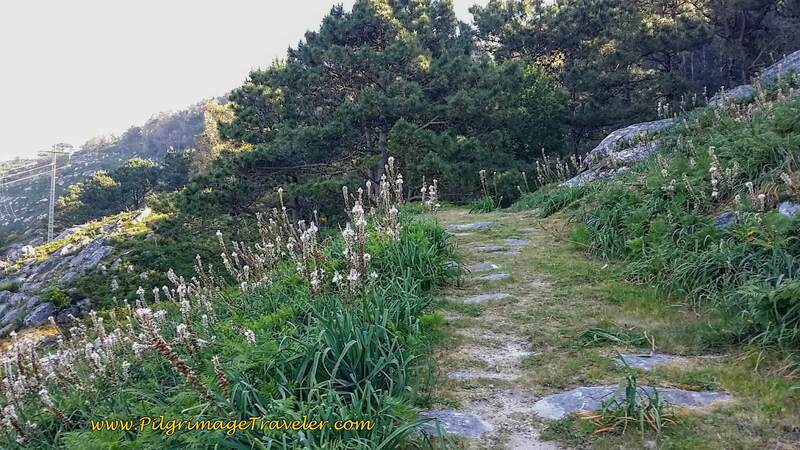 The road quickly becomes nothing more than a path, called the Camiño da Portela, the "Gate Road." Walk through the gate and close it behind you! The path becomes quite rugged as it climbs. The views are wonderful as you climb above As Mariñas. Soon it becomes apparent that this is an historic road. This looks like the rock was quarried out here to make way for the road. It is a healthy climb up to here, and a passing pilgrim shot this photo of the two of us at one of the viewpoints where we caught our breath. Almost at the top, the rocky road bears ruts from the wagons that traversed here. There are two obelisks at the top, after a nice 100 meter climb. The top is at 170 meters above sea level. Continue straight on here at the top. It is well waymarked, with beautiful, new concrete pylons. 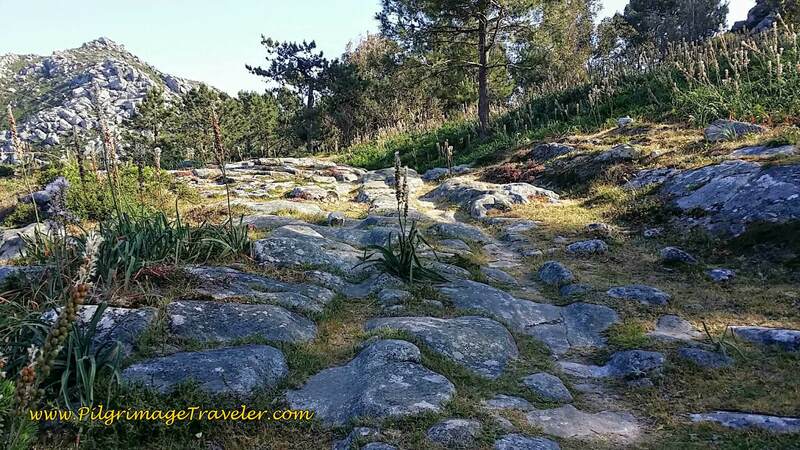 It is a lovely two kilometers worth of imagining that we were medieval pilgrimage travelers walking the ancient roads! Drop down the other side of the hill and onto the O Cabreiro street and turn right. 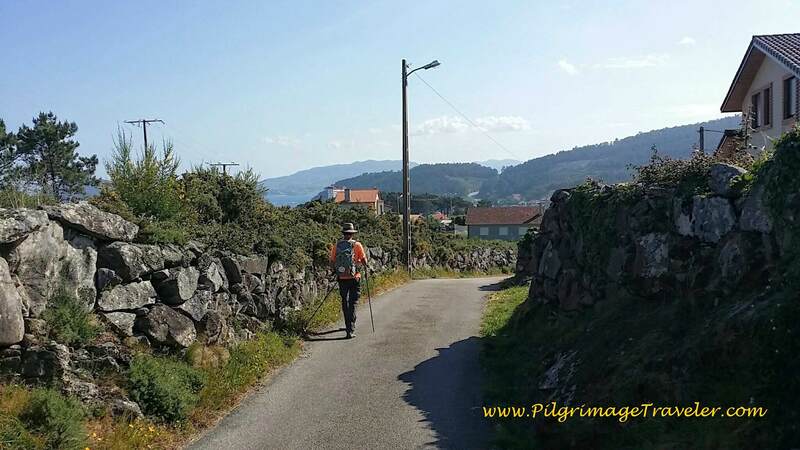 Walk on O Cabreiro St. for 0.9 kilometer on day twenty of the Portuguese Camino. O Cabreiro ends at a T intersection with a cruzeiro and you continue on to the right onto the Camiño O Sinal for 0.5 km as this street becomes the Lugar Ponte. Along the way, I would frequently stop to admire the gorgeous spring flowers. 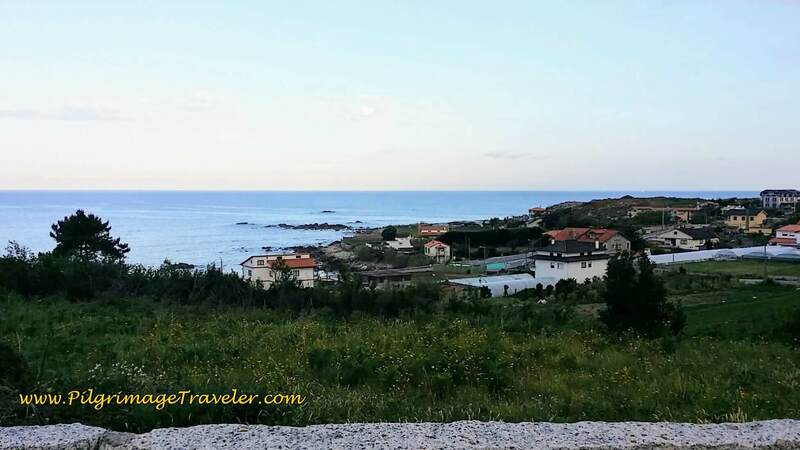 The small paved side roads have views of the sea, from a higher level than at the coastline and the Camino de la Costa meanders its way through the rural seaside country. 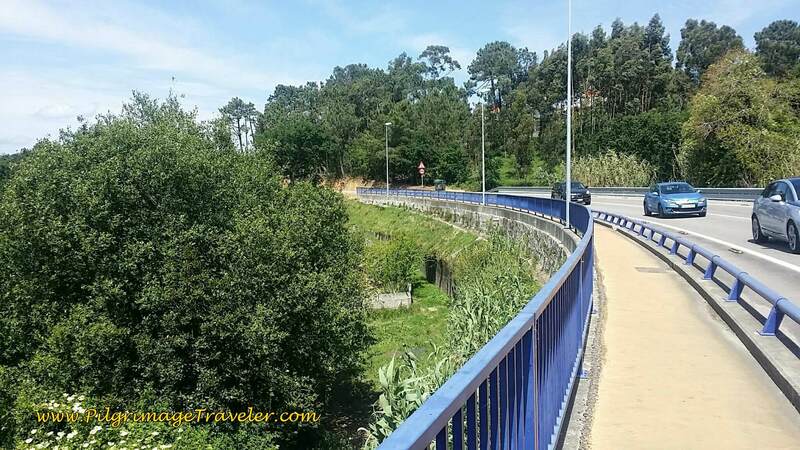 After walking 0.5 kilometers, stay right at the Camiño Río Pequeno, and start climbing a nice hill again, on a paved road. 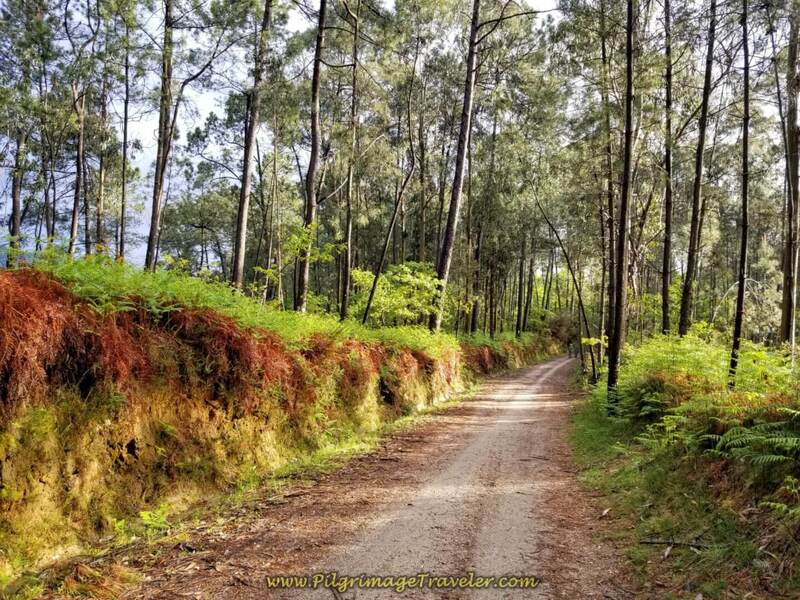 After only 300 meters, the road turns sharply to the right and you climb more steeply until you come to an intersection with the Estrada de Baredo. Turn sharply to the left to continue on this wider, paved road with no walking shoulder, as it continues to climb higher. This is the second strenuous hill of the day. The views are astounding from the top, of the islands out to sea. After 0.7 kilometer, come to a T and turn left on the EP-2202, for a very short distance as it crosses up over a superhighway, then an immediate right, here onto the quiet side road called San Anton, with a large cruzeiro on the corner. 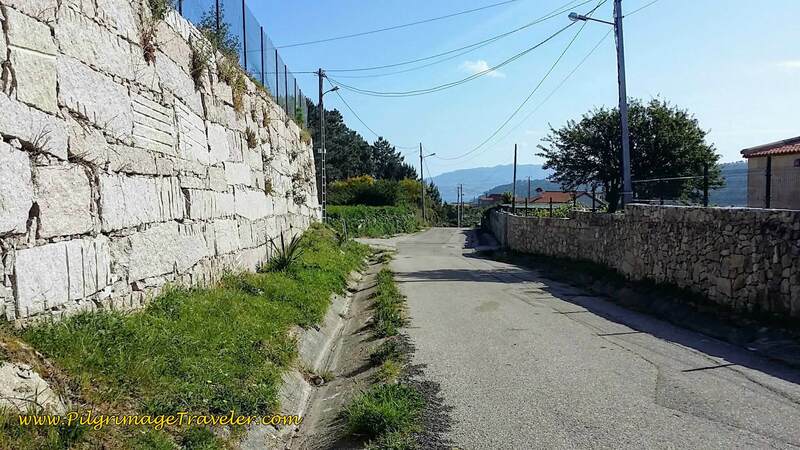 Begin the long, steep descent down hill, back towards the coast on narrow paved roads lined with high walls. The street twists and turns left and right as it descends toward the coast. 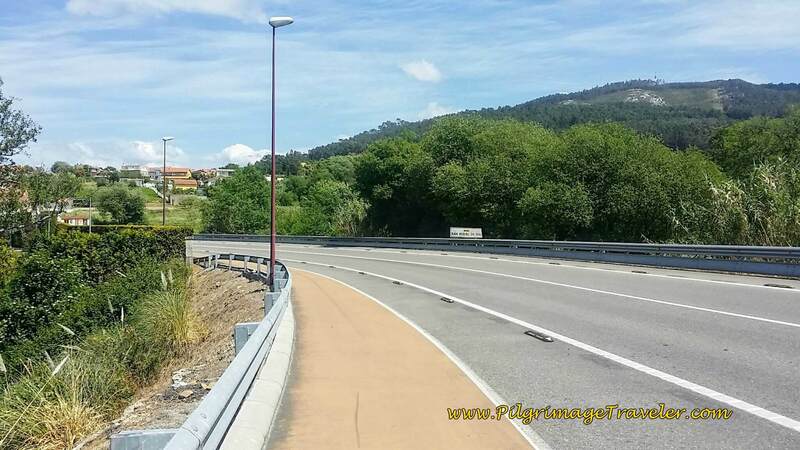 Turn right after 1/3 km onto the Camiño do Pino Manso, and continue your descent through the suburbs of Baiona. After 1/3 km, take a hard left on the Rúa Covaterreña. 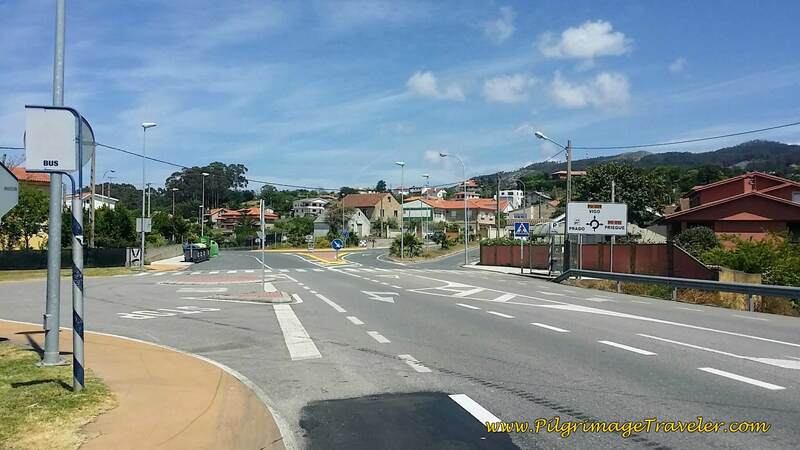 In another 1/3 km, you come finally to a large roundabout in Baiona. There is a large soccer field here, where you take the first right at the roundabout. 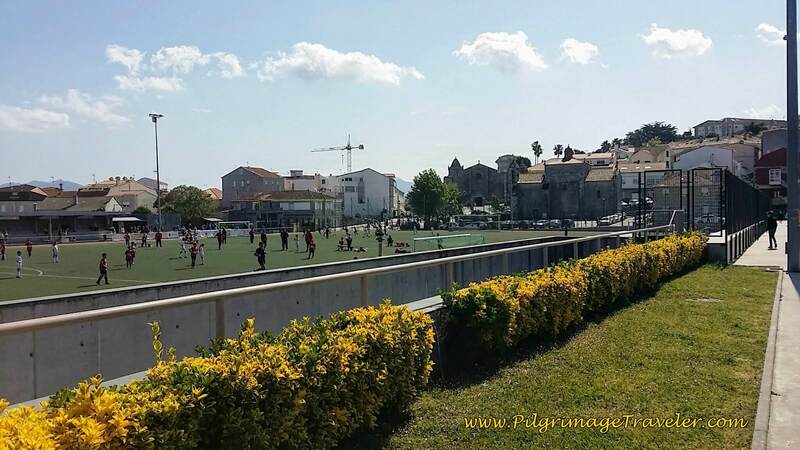 Walk past the soccer field and toward the prominent church to the east. 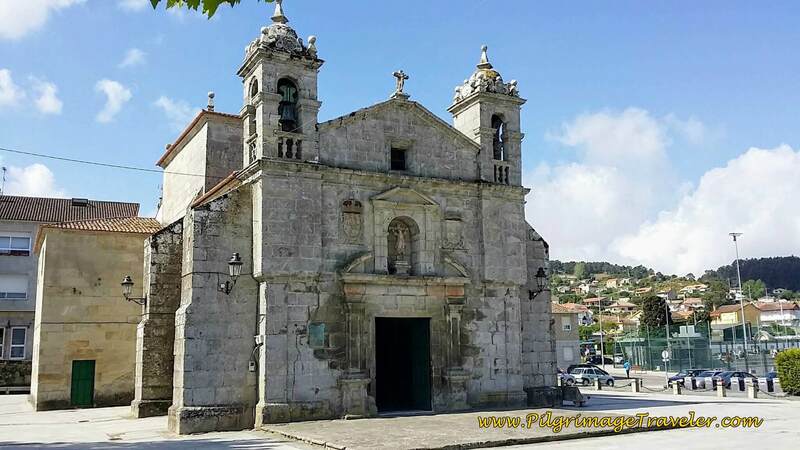 First come to the Plaza Santa Liberata and its church on day twenty of the Camino Portugués. 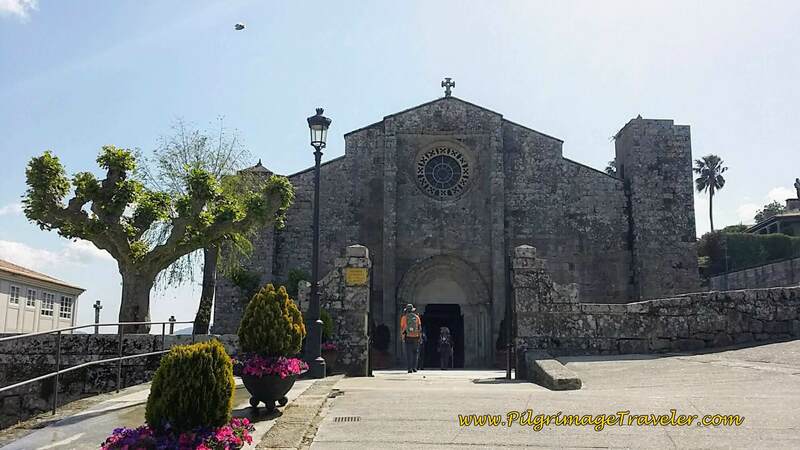 Directly east of the Santa Liberata is the Parish, the Parroquia de Santa María de Baiona, built in 1278 and restored in 1976, according to its placard. Inside there is a niche with Santiago depicted as a pilgrim. 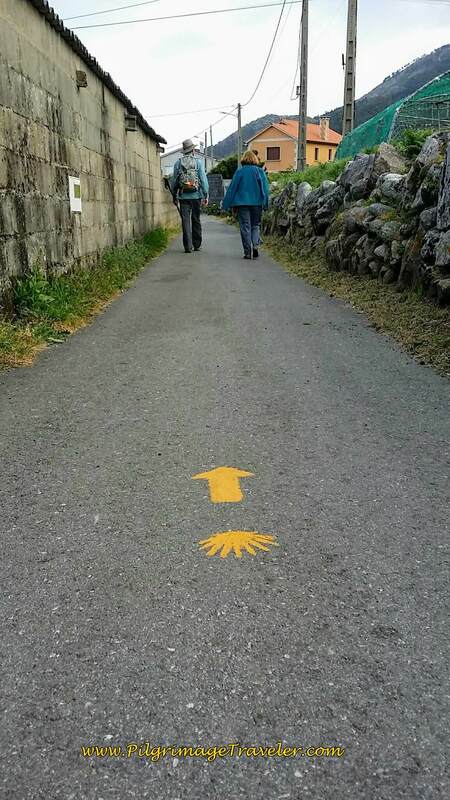 After the churches, we lost the Camino waymarks. 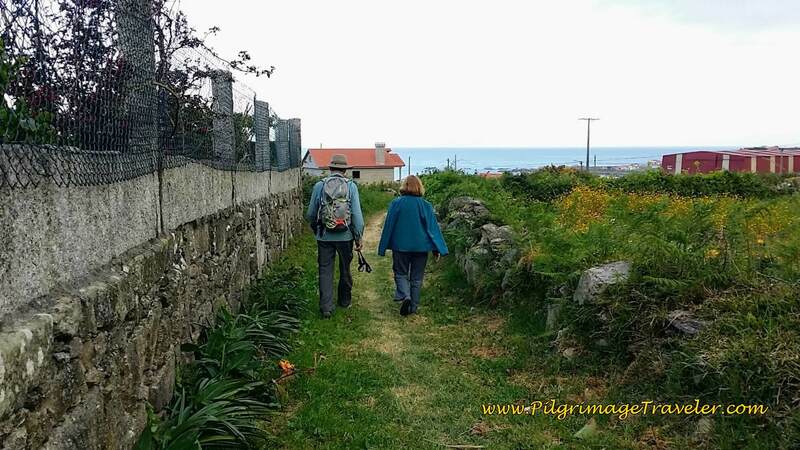 We walked east on the Rúa Santa Liberata, north of the Santa María church and just could not find any yellow arrows or waymarks. Essentially, we just wandered our way north, to find the coast, to continue onward. If you zoom in to our google map, you can see the circles we took! If this happens to you, just head to the coast. You can't go wrong. 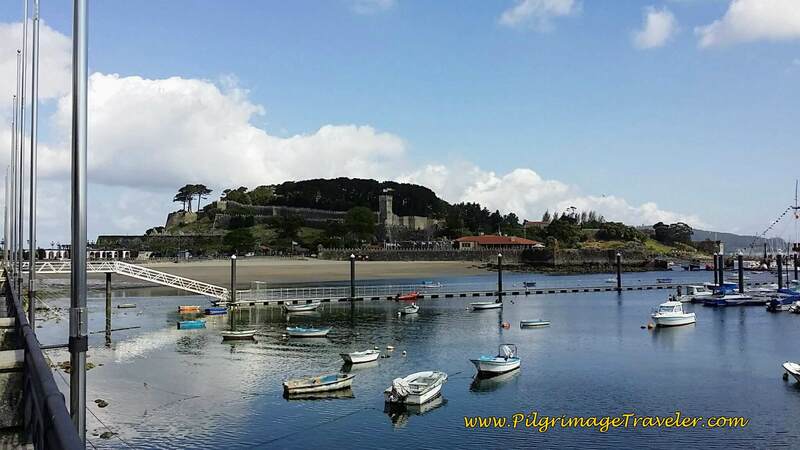 Once you find the Port of Baiona, it is a lovely place! We joined the PO-552 within a few blocks. 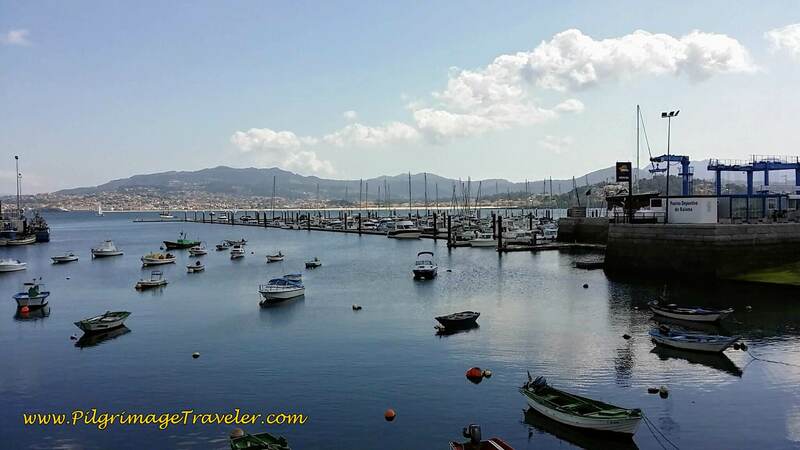 The Castelo de Monterreal is to your left at the point of the bay. 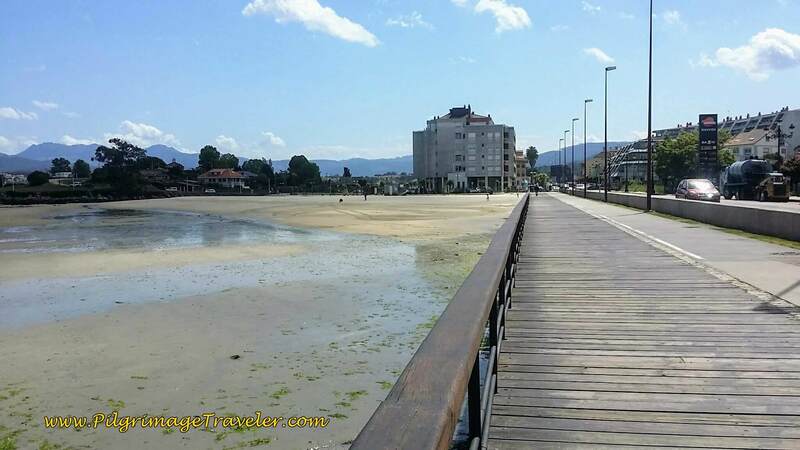 There is a nice promenade and boardwalk along the bay of Baiona to the beach, the Praia de Santa Marta. There is a chapel, the Ermida de Santa Marta just by the beach on the small peninsula to the north. We walked eastward along the PO-552, full of shops and restaurants for about one kilometer on the way to this beach. 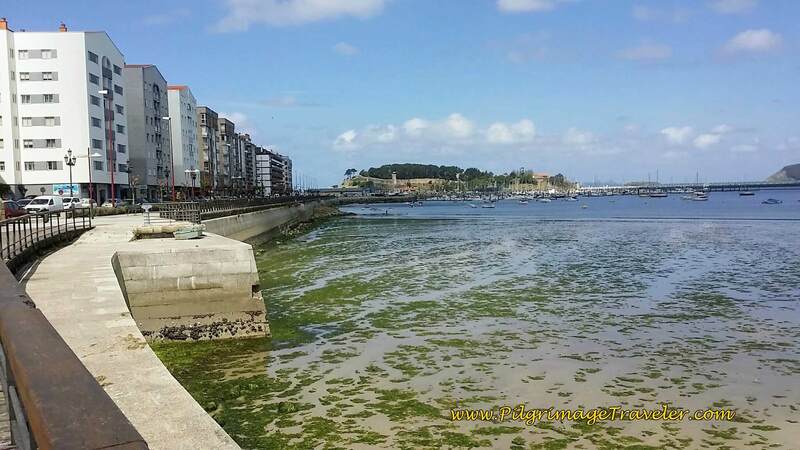 Here is a look back to the promenade, the harbor and the Castelo. Just before a roundabout and the Santa Marta Beach we stopped for a break in the Pasteleria La Mallorquina, for café con leche and pastries. Who should come stumbling by as we were sitting there? Hiro, from Japan! He joined us for coffee and we caught up on his pilgrimage since the crossing to Spain. He was grinning from ear to ear, truly enjoying his journey. We were so lucky and proud to be a part of it. 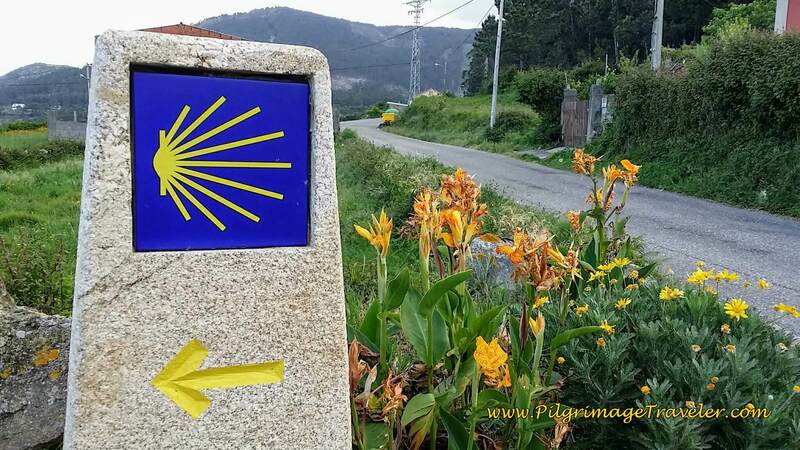 We marveled at how a Japanese man, who didn't seem to have much preference for any religion at all would find himself on the Camino de Santiago! God had to be hidden somewhere in it, don't you think? After our break, we walked on together, and took a little jog along the Santa Marta beach toward the chapel, then joined the PO-552 again. 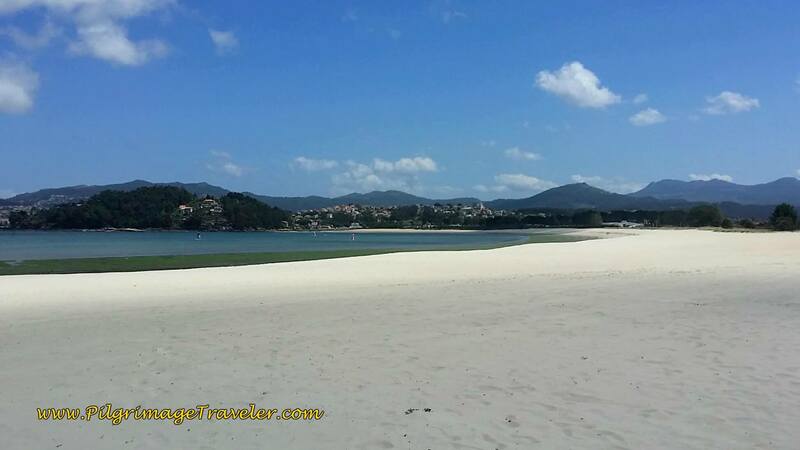 In 100 meters we turned left on the Avenida Praia Ladeira, to the next wonderful beach, the Praia Ladeira. Who should we stumble onto here, but Janny from the Netherlands. It was a wonderful reunion. The four of us walked on together. 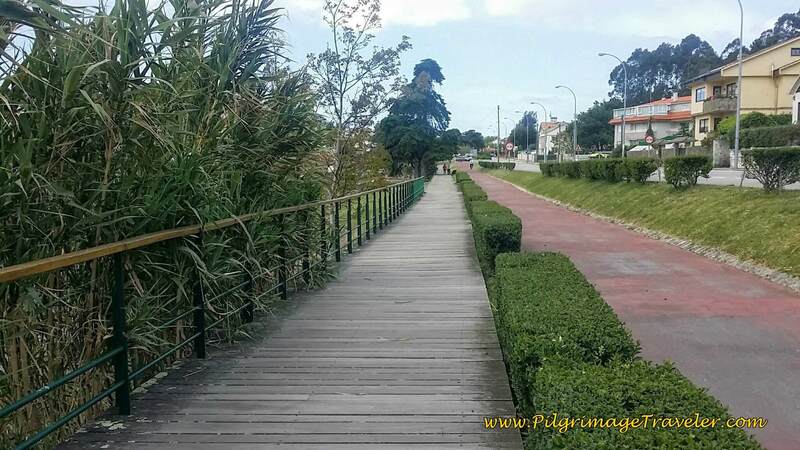 The Praia Ladeira is a beautiful long beach, with a paved pathway/bikeway running right next to it for the pilgrimage traveler to walk upon. This pathway soon leaves the beach but continues for a full two kilometers, paralleling the highway (PO-552) on the right and the estuary of the Río Miñor on the left. The path goes all the way to the bridge crossing the river. When you come to the bridge, there are two of them crossing over into A Ramallosa. One is a modern bridge and right next to it is the medieval one, the Ponte Romanica, built in the the 13th century. Here is Rich and Hiro on the modern one. Here is a view of the river Miñor. It was a dry year and the river was extremely low. Right beside the modern bridge is the medieval bridge, below. 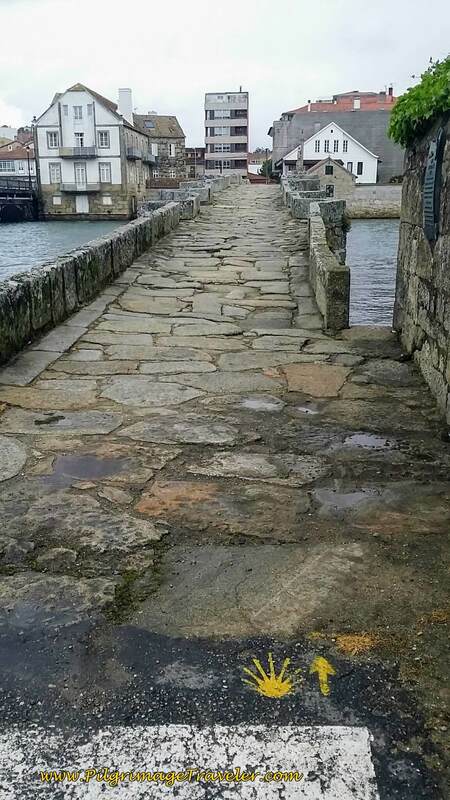 The Camino walks across the old bridge, below. Walk the 100 meters across the bridge. 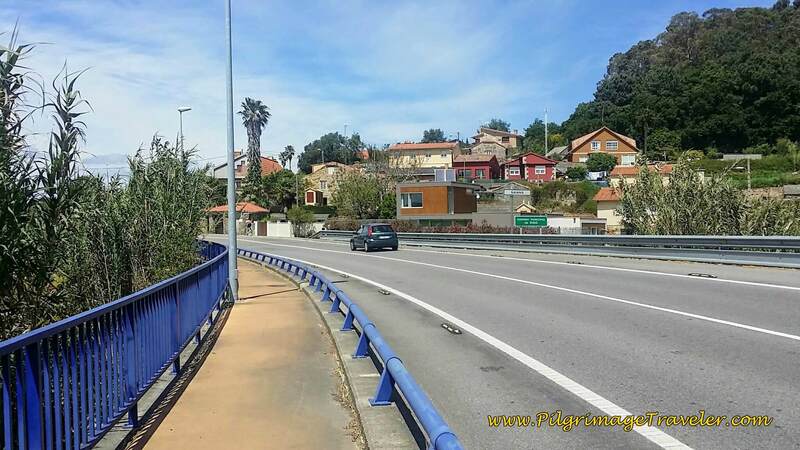 If A Ramallosa and the El Pazo Pías Albergue is your destination, keep walking straight onward after the bridge. We said goodbye to Hiro and Janny here as they were planning to stay in A Ramallosa. We hoped to meet up with them again, farther along! 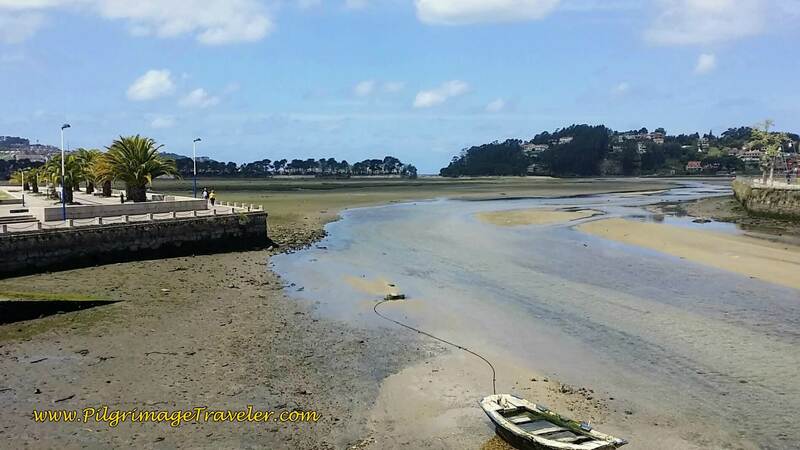 We chose to continue onward, via the Senda Litoral. After the bridge we turned left on the continuing bikeway, by this lovely little chapel, the Capela San Campio. It looked very Portuguese with its blue murals. 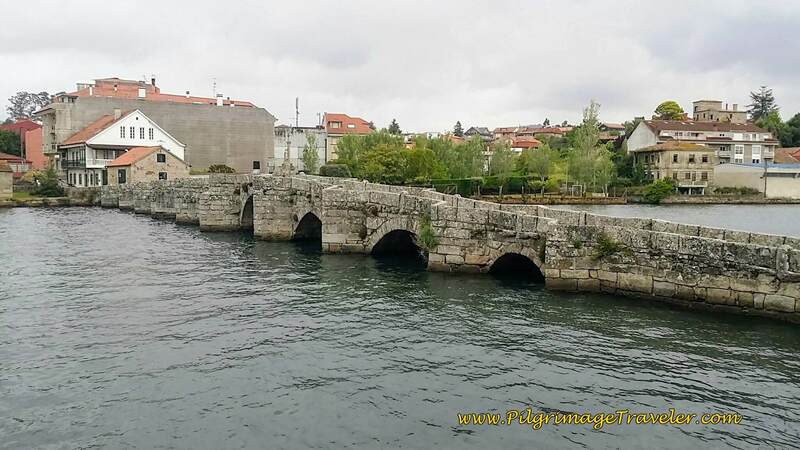 If you walk across the medieval bridge you will have to turn left at the roundabout to continue to follow the Río Miñor. 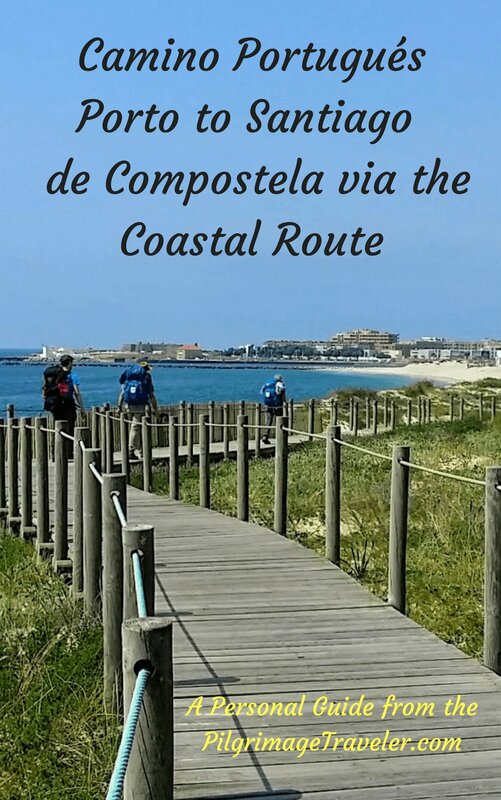 If you are starting from the Albergue in A Ramallosa, the Coastal Route goes directly north, from the Albergue through town. I do not have information regarding this route. The Senda Litoral on the bikeway along the river parallels the PO-325. 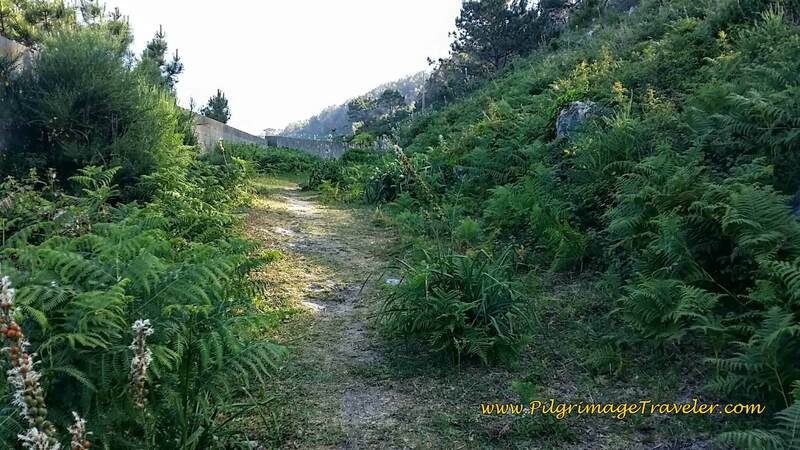 We had finally left the PO-552, at least for our day twenty on the Camino Portugués. 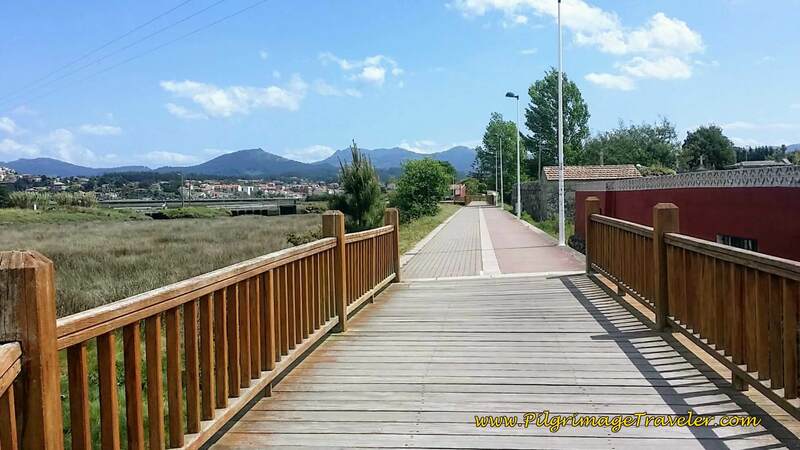 As the path follows the River Miñor it is called the Paseo da Ramallosa. 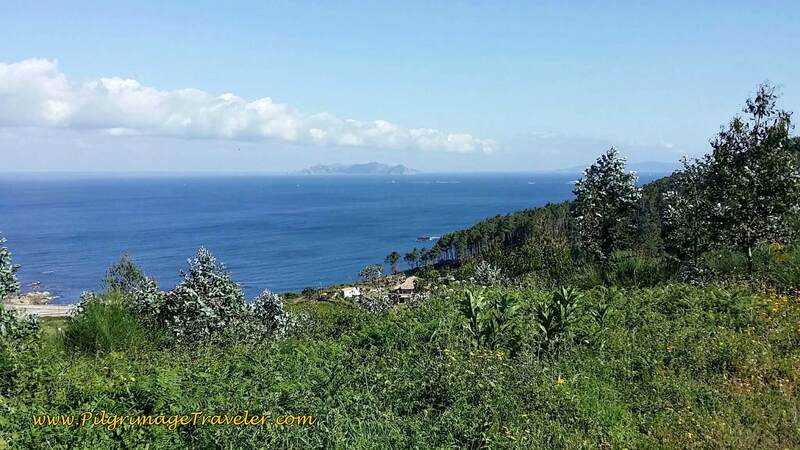 You can see the peninsula the Monte Lourido ahead where the mouth of the river narrows, and the large estuary ends. This is where the bikeway ends. 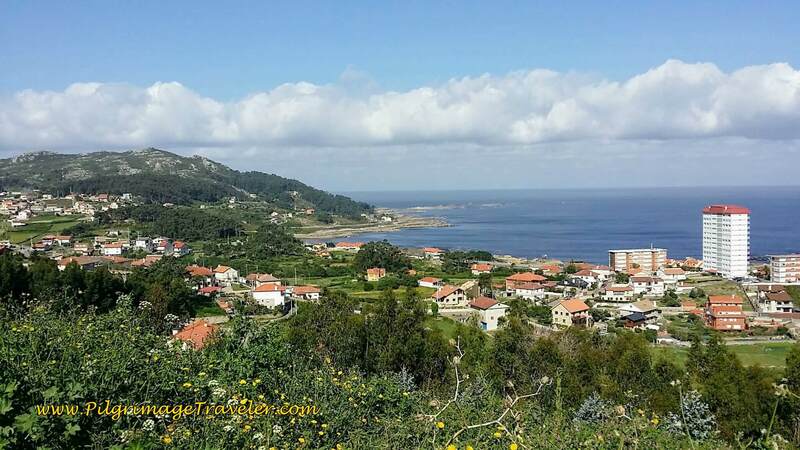 We stayed inland at the Monte Lourido peninsula, to continue walking on the PO-325. There are no yellow arrows here, so we walked along the highway until the wonderful beach, the Playa las Americas (Praia America) begins to appear to your left. It is only about 1/3 km to cross the peninsula towards this beach. We joined the Avenida Praia America when it was feasible and followed the walkway running parallel to it. 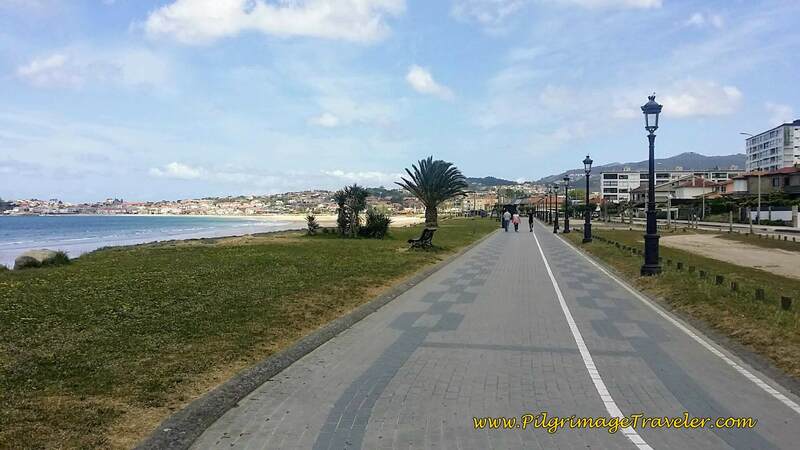 It is a lovely promenade that you can stay on if the weather conditions warrant it. Here is a photo of Rich planning our route at the Praia America. 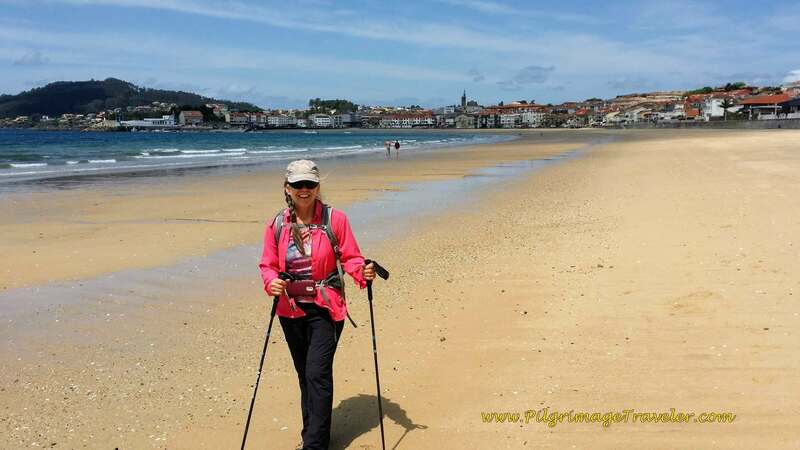 Here I am, looking back and on the beach with Baiona in the background to the south. Of course, we had to leave the walkway, and join the beach! If ever there was a place to walk on the beach, the Praia America is the place! It is a good two kilometers or more in length! 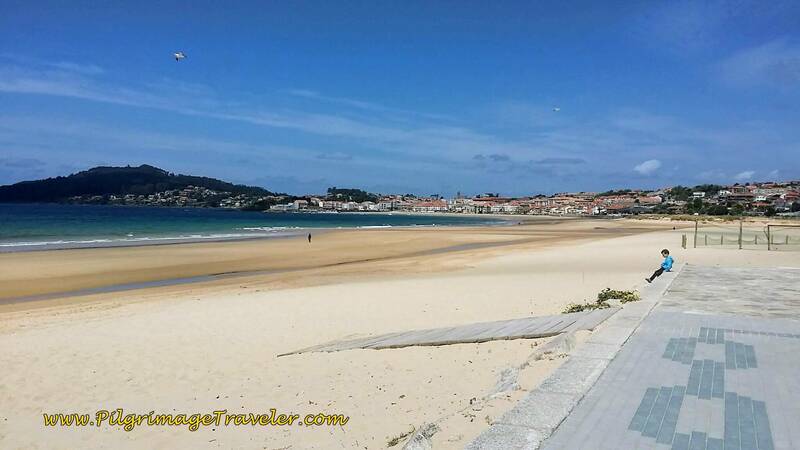 Should help you get your beach fix for your day twenty on the Camino Portugués. It did mine! Two Kilometer Walk on the Beach! The Praia America becomes the Praia Panxón at the northern end. We stopped at a beach side café for a bite to eat on this beach. Cafés abound here along the waterfront boardwalk of the Praia Panxón. 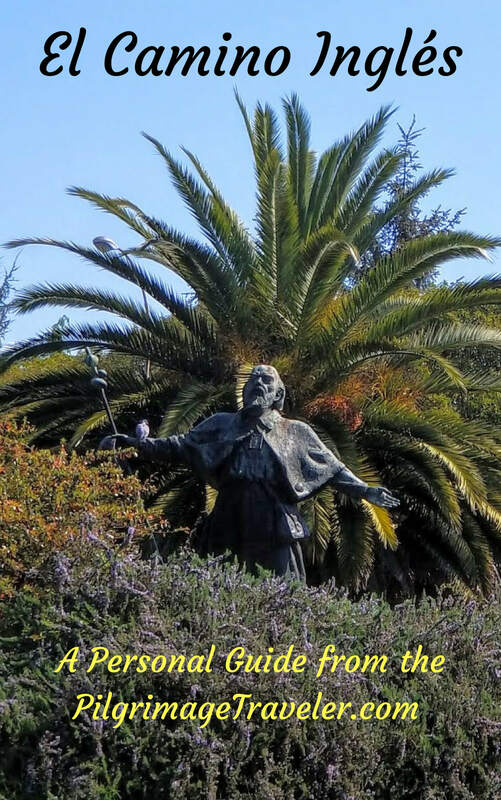 After our lunch, instead of staying on the beach for its entire length, we picked a street going eastward from the boardwalk to climb a hundred meters to the Rúa Jesús Espinosa. We continued to climb on this street towards a very unusual church at the top, the Parroquia de San Xoán de Panxón. There is within the courtyard of this church a 10th century remnant of an archway. Click on the link above for more information. We knew nothing of this historic site when we passed. But YOU will know, thanks to our research! 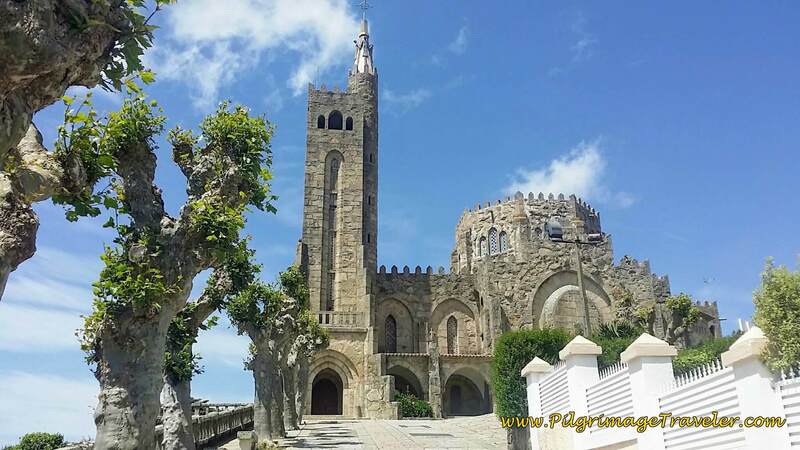 Our goal was to get back to the PO-325, which we did by turning right at the church on the Camiño dos Lagos. It is only 0.6 kilometer from the waterfront to the highway. We wanted to take the shortest route to our planned end for the day, and walking on the PO-325 was it. 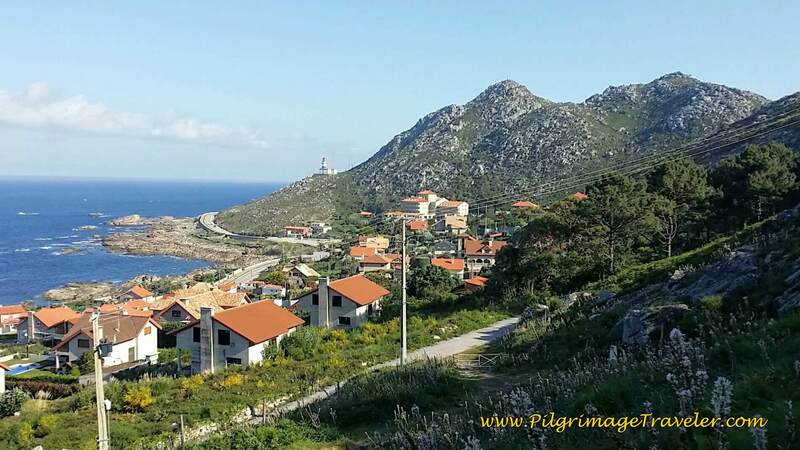 At this juncture, the pilgrimage traveler could continue on the Senda Litoral, right along the beach, crossing the next penninsula, by the Monte Ferro to the next beach, the Praia Patos. 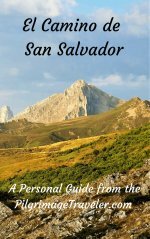 The Senda Litoral does a lot of undulating back and forth from the highway, in the next section, and we chose to take the direct route, by staying on the highway. We had had enough of beach walking. However, the choice is entirely yours. Create your own journey as you see fit! 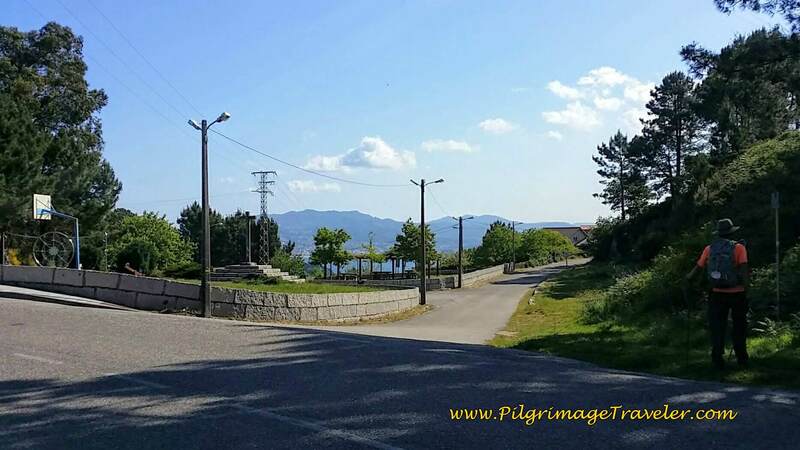 If you follow our route north, on the PO-325, it is a 4.4 km jaunt to where we chose to stop for the day, at a bus stop, to take the bus back to Baiona. This way, we did 1/2 the traditional stage that goes only from A Ramallosa to Vigo (a short 20 km) stage. 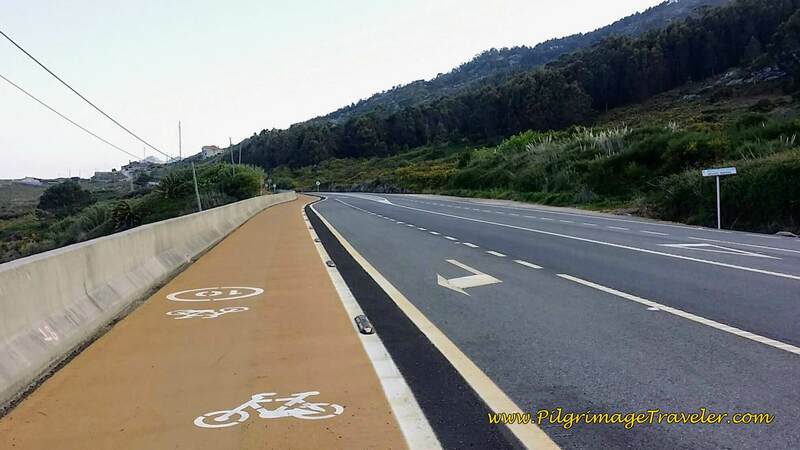 There is a nice bikeway along the highway and it is very safe for the pilgrimage traveler. The views of the sea from the highway are still lovely, maybe even more so from the higher vantage point, than from down at the beach level. 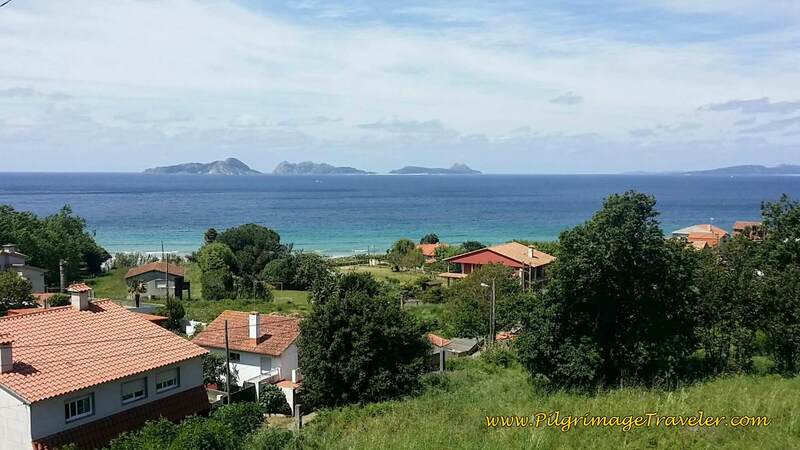 Here is a view to the Cies Islands to the north. We walked on at this intersection in the town of Prado. ...until reaching our goal, San Miguel de Oia. We photographed the next kilometer marker sign so we could find our way back to this point on day twenty-one. Now that we sealed our location, all we had to do was find the next bus stop. The next bus stop was across from the O Solpor Cake & Coffee, shown here. Here is the actual bus stop, below. You can see the restaurant across the street, and the sign, looking southward. 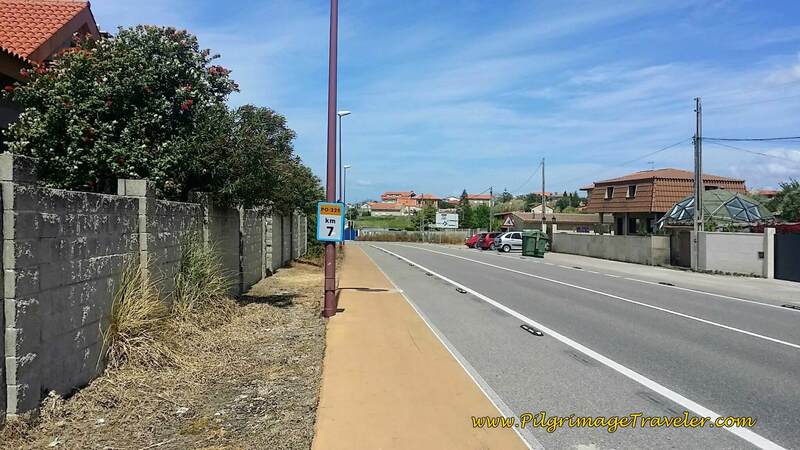 You must, of course, be on the west side of the road, if you are planning to take the bus south and back to Baiona. 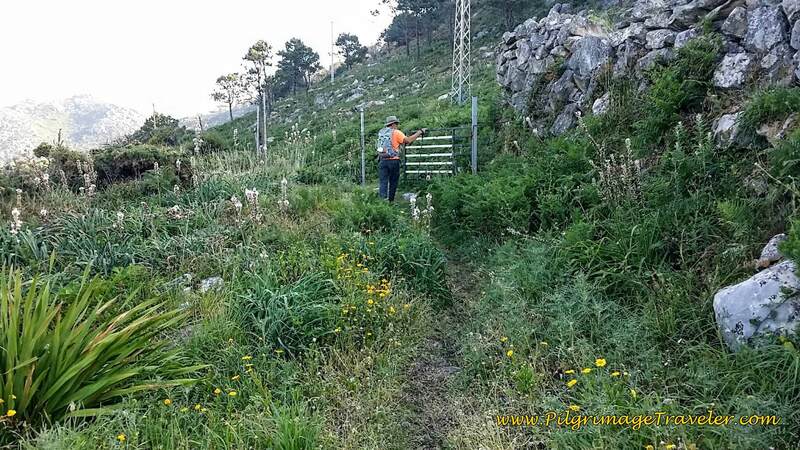 It is the ATSA line that you want if you plan to bus back to A Ramallosa or Baiona from any point along the PO-325. Click here for the time table. During the weekdays the bus comes from Vigo about every 1/2 hour, Saturdays and Sundays about every hour. 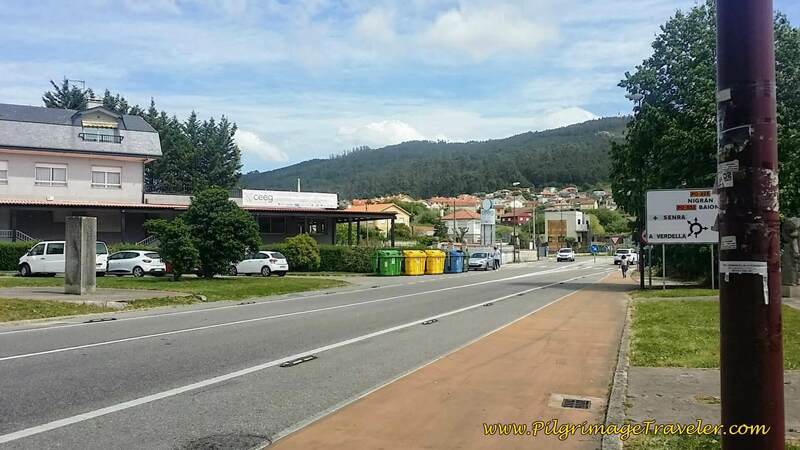 You will notice that they do not give stops along the route, nor arrival times at any specific stop, only when the bus leaves Vigo (Salidas Vigo in Spanish). You can ask the locals where the nearest bus stop is, from where you happen to be. Since we were here on a Sunday, we waited a long time, almost a full hour for the bus to come, originating in Vigo. But we didn't dare wait in the Cake and Coffee place, for fear of watching the bus go by! And no one could tell us at the restaurant what time the buses came! When the bus arrived, we were so glad to see it! The traffic back to the soccer field in Baiona, the end of the line, was horrendous! Poor Gylvia! Once again she waited a long time for us to show up in Baiona. She drove us back to her house, the "Albergue de Glyvia" in Viladesuso (see day nineteen), for another wonderful evening of being spoiled to death! She was so gracious a host. She had prepared for us another veritable feast; homemade spätzle, (she's German after all), with cheese, fried onions and a tuna salad with lettuce, onion and tomatoes (the classic Spanish ensalada mixta) and of course, more kuchen (cake) and lots of wine. We reconnected deeply in her lovely home. We were so grateful for this day and for her compassionate care of us! 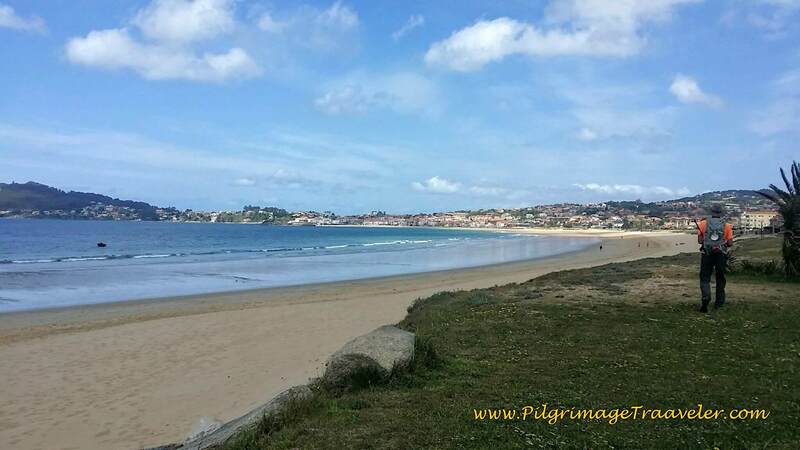 Our day twenty on the Camino Portugués por la Costa was a lovely day. 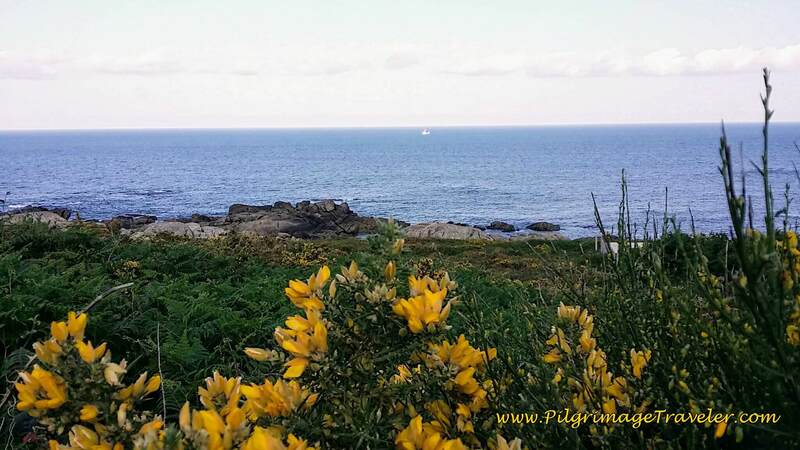 We reconnected with old pilgrim friends, had more wonderful moments with our friend Glyvia, walked on ancient paths, connecting with medieval pilgrims of yesteryear and were able to spend precious time on some of the most beautiful beaches I have ever been on. I believe the depth of our lives is found within the deep connections we have with others. Not only do we find God within our own hearts, but also within the hearts of others. 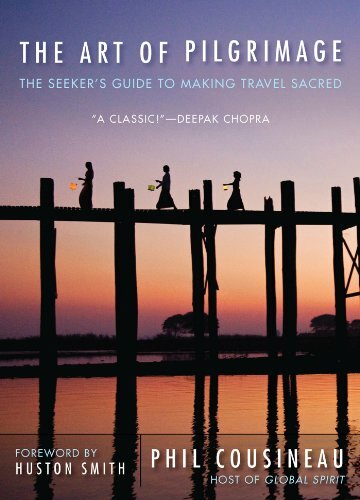 It is through a physical pilgrimage that, if we are open, we can begin to understand about the pilgrimage of the heart. 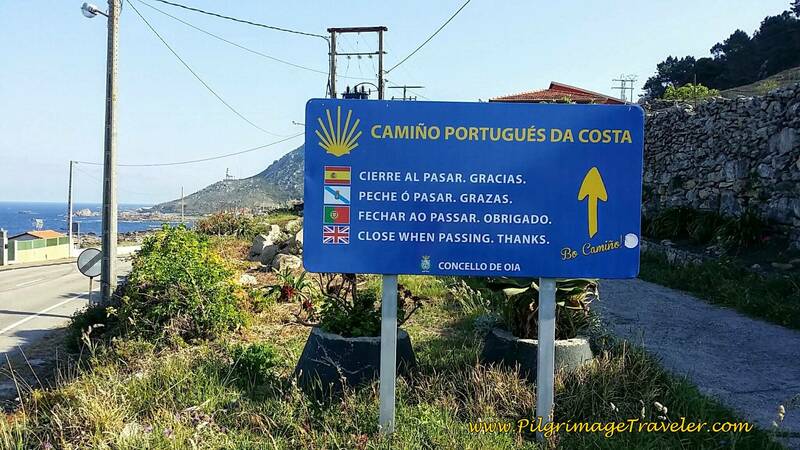 It was a special day indeed, on day twenty of our Camino Portugués. 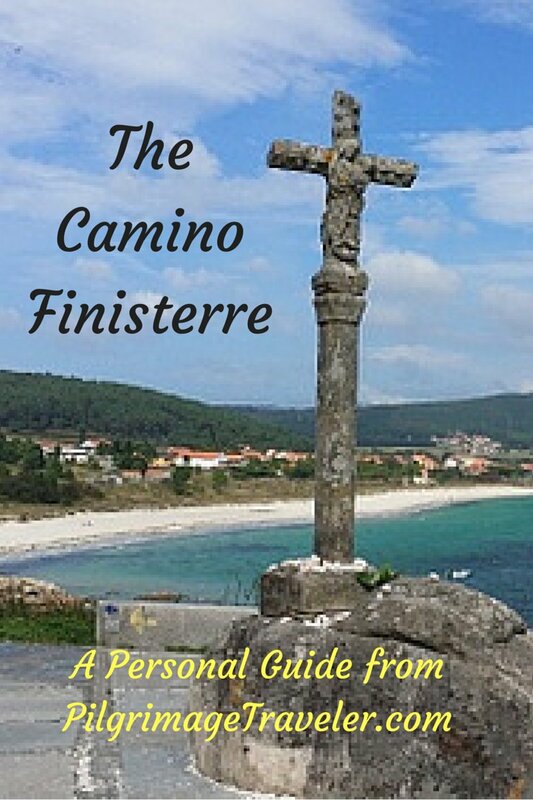 May your own day twenty on the Camino Portugués por la Costa be filled with all the depth of God hidden in it. 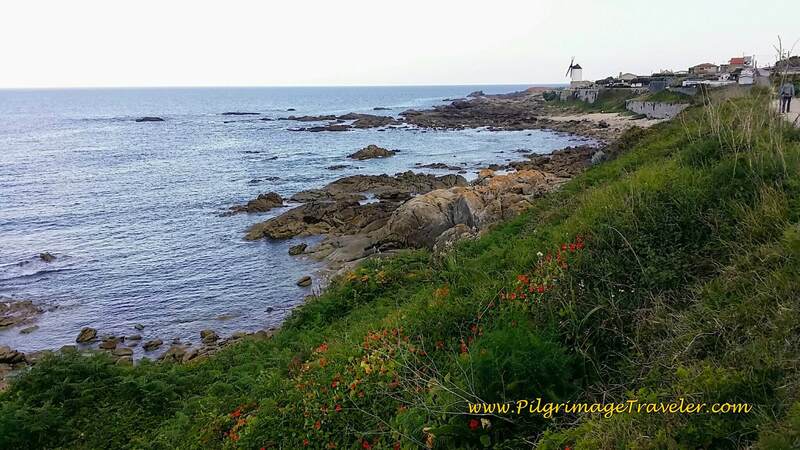 May your connections with other pilgrims be loving and true. May you find God in each and every one! Ultreia!